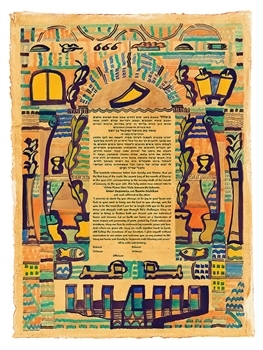 Beginnings 24" x 32" (Giclee) - This patchwork of Jewish symbolism, lively pattern and vivid color results in an irresistable design that is a joy to behold. Each time you look at this piece you will see something new. The parchment background adds a mood of antiquity. 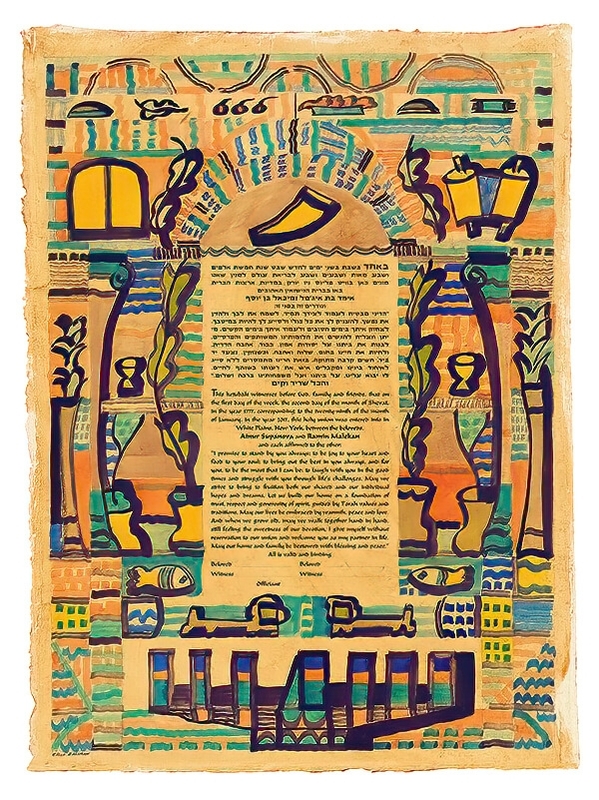 Elliot is a prolific artist who has always been fascinated and inspired by biblical themes and Jewish symbolism. These he has re-viewed and transformed into his own personal vision. His art is meditation, prayer and joy made manifest. Through years of steadfast commitment and passion toward his work, Elliot has developed a unique style of painting informed by Cubism and Post-Impressionism. His work is in private and public collections in the U.S. and Europe.